In a surprise move, the result of the Nokia buyout by Microsoft is a new Android based phone, the X2. (Yes, I double checked that it was not a 1st April story). 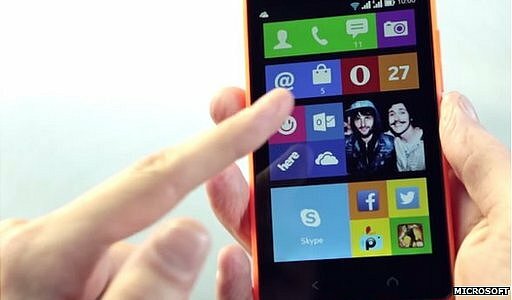 BBC reports that the mid-range smart-phone will be Android based, but that the UI will look like Microsoft’s Windows Phone. At an estimated price of 100 Euros, the specs are not overwhelming, with 1 GB RAM, 5 MP camera. However, interestingly it’s a dual SIM phone. That suggests it’s targeting the Asian market, where people are shopping around for the best SMS and calling rates, and dual SIM phones are very popular. As expected, the phone will not feature the common Google service apps, like Gmail, Calendar, Hangouts, Maps, and Youtube, but instead replace them with Microsoft equivalents like Outlook, Skype, and Bing. However, it also means that the Google Play store will not be available either, so Microsoft and Nokia will somehow have to back-fill their own market. Or perhaps developers will have to submit their Android apps to yet another market. Many open source apps are already dual-hosted on Google Play and the free software based app market F-Droid. Just found a great driver app for the Android: “BlueInput” by Teksoft. It’s also available on the market, easiest found by the company name. It claims to support a multitude of bluetooth keyboards and mice. What’s best, it worked perfectly with my old Nokia SU-8W right out of the box. Finally, I don’t have fumble with those on-screen keys any more. With Android out of the door, IM chat over IP on the mobile will soon be a staple. Paying for SMS text messaging will soon be a thing of the past. However, what about all those other devices which hasn’t caught up yet? fring saves the day! Fring supports text chat for Skype, MSN, Google Talk, ICQ, SIP, Twitter, Yahoo! and AIM. Furthermore, it supports Skype and SIP voice over IP, which should be a welcome service. Finally, it can connect to Facebook, Gmail Notifier, Vtap Video Streaming, Orkut Social Network, Yandex Push Email, and more. From your phone, you can download fring by pointing it to m.fring.com. On my N80, two applications were installed, and fring started up automatically. You’ll have to sign up for an account, and then add the IM networks you already use. Your friends will automatically appear in a searchable list. Tonight brings yet another classic on to my N80. Using the ScummVM virtual machine for the old LucasArts games, it is possible to use the old files on the mobile. ScummVM is by the way implemented for a wide range of devices and OSes, including Fedora, Debian, Ubuntu and other Linux distributions, PalmOS, Symbian, Nintendo and so on. As for the games, you’ll have to buy them yourself. However, those floppies you bought in the early 90s only had an expected lifespan of four till five years. Searching for abandonware zak mckracken, or download monkey island might get you what you’re looking for. Yes, the headline is correct. Tonight I just installed the classic FPS on my mobile! It is in fact rendering very well, and quicker than what I remember from 15 years back on the PC. True, the CPU on the mobile is probably ten times faster than the 33 MHz 386 we had at home, and the screen is very small, but I’m still impressed. Make sure you put the WAD file under E:\wads (on the memory card). Now, you might think that is quite nifty. But it gets better! I recently bought a SU-W8 wireless bluetooth keyboard. And of course it works perfectly with the game too! Including CTRL for firing and ALT+LEFT/RIGHT arrows for strafing. If the engine could flip the view 90 degrees to use more of the screen space, it would be perfect! Also useful, is Petteri Muilu’s Auto key lock for N80 which does not have this feature built in. Yesterday it was an SSH client for my mobile. Today? How about a public transport guide for all major cities of the world? Or maybe a bar code scanner for 2D bar codes (See also Tommi’s S60 blog)? I just installed putty SSH on my Nokia N80. And I can now log in to my home computer over SSH from ANYWHERE. Is that cool or what? hblok.net 2014. "Life is Simple" is a simple theme for WordPress, powered by Chereshka.